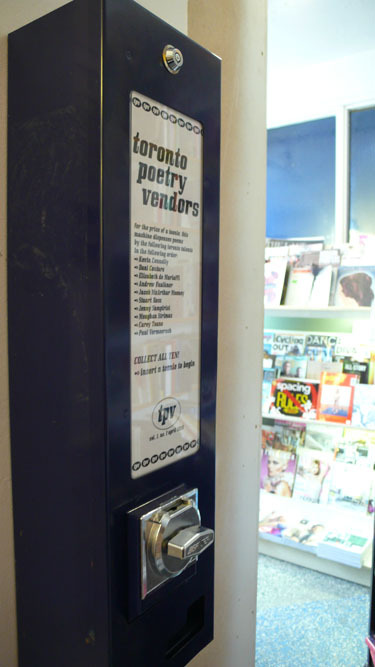 Toronto writers Carey Toane and Elisabeth de Mariaffi recently began a project called Toronto Poetry Vendors, and celebrated the launch of poetry vending machine in This Ain’t the Rosedale Library. It’s a great idea. What do you think is the appeal of a poetry vending machine and what kind of response have you had? Elisabeth: Well, there’s the novelty factor, that’s kind of the first thing you think of. The broadside is a very old tradition, and at the same time what could be more modern than complete poetic automation? I think that as a group, poets are always looking for new ways of publishing, new ways to mess with the words. I also think that poetry just lends itself so nicely to this format. A broadside is a great way to get a single taste of a poet’s work and a single poem can be read and re-read anywhere: on the sidewalk, on the subway, in an elevator. Carey: And poetry can be taken rather too seriously sometimes, especially by poets. From the big manual crank and the candy-coloured paper to the mystery of the author and the poems themselves, we wanted to inject a bit of simple fun into the whole affair. It’s a casual poetry experience. Everybody likes a surprise. Elisabeth: The response has been extremely positive. So far we’ve placed three permanent machines: two in local, independent bookstores, and one coming soon in an independent coffee house, and I find that in general whoever I talk to about the project wants in. Our first machine, code-named Spearmint, launched on April 25 at This Ain’t the Rosedale Library in Kensington Market (the other in Type Books on Queen St West). Six of our ten contributors were on hand to read their work and the store was packed. We’re looking forward to holding similar events for subsequent machines and introducing a larger model, a traveling machine that can go to festivals and small press fairs. In fact, our traveler will debut at the Meet the Presses Indie Literary Market at Clinton’s on June 5.